Switchel, also known as Haymaker's Punch and Swizzy, is a healthy and tasty fermented drink that originates in the Caribbean. It is a zesty drink that combines the benefits of apple cider vinegar, raw honey, lemon and ginger for a refreshing drink that quenches thirst even on the hottest summer day. * Apple Cider Vinegar: This makes a fermented beverage full of antioxidants and minerals such as calcium, magnesium and potassium. * Honey: A nutritious source of natural vitamins, minerals, antioxidants and enzymes, honey is a diabetes-friendly sweetener that benefits digestive health and the skin. * Ginger: It contains natural anti-inflammatory and antioxidant properties that are beneficial for those with digestive and stomach problems. It gives the warm, spicy bite to the drink. * Lemon: This is added for flavor and its excellent source of Vitamin C.
1. 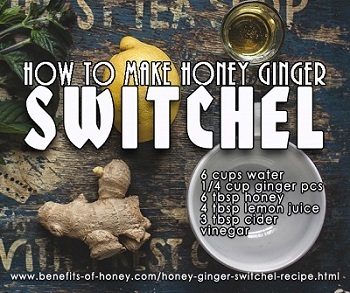 Combine 2 cups water with the smashed ginger pieces in a small saucepan. Bring to a boil. Boil for a few minutes. Remove from the heat and let it cool down. 2. Strain the ginger-infused water into a jug. Press on the ginger pieces to extract the liquid. 3. Add honey and stir the mixture until all the honey is dissolved. 4. Add lemon juice, cider vinegar, and the remaining 4 cups of water. 5. Store in the refrigerator and chill overnight. End of "Honey Ginger Switchel Recipe". Back to "Honey as Home Remedy"